Each extra large flower head opens from appleblossom pink rosebud buds. The blooms keep coming right through the summer months and well into autumn and contrats perfectly against the brigh green faintly zoned foliage. This is the perfect plant for a large patio container and also makes a lovely plant for indoors. Supplied as 6 Jumbo Plug Plants Flowers from May until first frosts in the autumn. Popular since Victorian times and in those days said to be the Queen's favourite flower, this is a heritage variety with a modern twist as it has benefited from re-selection over the years to make a wonderful garden plant for today. 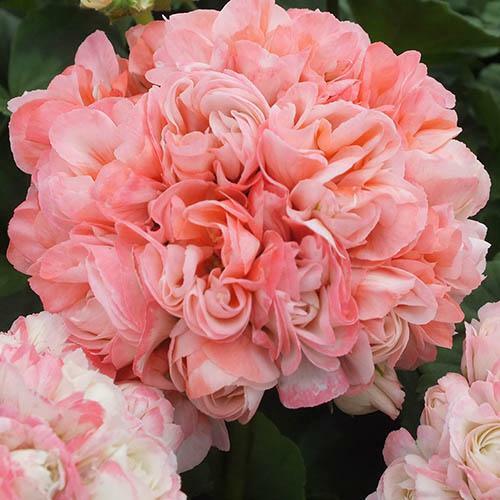 Each extra large flower head opens from appleblossom pink rosebud buds held in a dense cluster, forming a luxurious salmony fully double inflorescence which lasts for many days. The blooms keep coming right through the summer months and well into autumn and contrats perfectly against the brigh green faintly zoned foliage. This is the perfect plant for a large patio container nad also makes a lovely plant for indoors. Why not enjoy it outdoors for the summer and re-pot for indoors when the weather turns colder. Supplied as 6 Jumbo Plug Plants (2.5 - 3.5cm diameter). Flowers from May until first frosts in the autumn. Not frost hardy so keep protected until the last frost. Pot on for 3-4 weeks before planting.